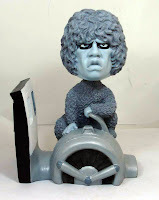 New Twilight Zone Gremlin Bobble Head! Re-enter the Twilight Zone with Bif Bang Pow! 's first Twilight Zone offering of 2010. Pre-order the all-new Gremlin from the famous "Nightmare at 20,000 Feet" episode starring William Shatner. This ultra-creepy bobble head is authentically designed and painted in a black-and-white motif. Inspired by one of the most memorable scenes from the show, the remarkable airplane-wing base has the Gremlin sitting on the engine housing, tearing pieces from the wing! The bobble head also features the perspective from the inside of the airplane cabin with the window that faces the Gremlin. Order yours today! If Venture has a name, it must be Bif Bang Pow! You have no idea how long I've been waiting to use that tag line. Greetings and salutations to all Bif Bang Pow! followers and believers of all shapes, ages and sizes! Well, as you've probably heard by now, we did it! 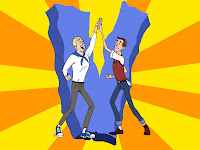 Once again, we're bringing the people what we KNEW they always needed, toys for 'The Venture Brothers'! (If this keeps up, we'll finally give the world the James Bond action figure and vehicle line it's been dreaming of). And just to prove this isn't some internet rumor, we even went as far as having the news printed in a magazine! 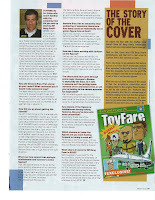 Yes, the new issue of action figure bible Toy Fare Magazine hit the stands today (Issue #151), and in it you'll find an informative, witty and at times heartwarming interview with yours truly, which somehow manages to make me seem like I know what I'm talking about too! Pick it up, I dare ya, and see if I'm lying! Go on! Labels: action figures, bobble heads, Cartoon Network, Venture Bros.
Another New "Venture" for Bif Bang Pow! Action Figures, Bobble Heads, and Vehicles Based on the Adult Swim Series, The Venture Bros.
LOS ANGELES, CA (January 7, 2010) – Bif Bang Pow! and Cartoon Network Enterprises, the licensing and merchandising arm of Adult Swim, blast off for action with today’s partnership announcement that will bring to market a brand-new line of toys based on the popular animated series The Venture Bros. One of the most highly sought after product lines from Adult Swim’s library, The Venture Bros. collection from Big Bang Pow! will feature an array of articulated action figures, bobble heads, and vehicles, each embodying that distinctive action-comedy mix that has become synonymous with the series. Dr. Venture, The Monarch, Brock Samson, Hank & Dean Venture and more. Several exclusives are also in the works. More detailed information about the products will be made available in the coming weeks. "We've been courting The Venture Brothers for quite some time now, and we're beyond excited to finally bring fans what they want: a range of fully articulated action figures and bobble heads," said Jason Lenzi, CEO of Bif Bang Pow! "With the ever-expanding cast of characters in the Venture universe, the possibilities are endless. And, as always with Bif Bang Pow!, expect the unexpected!" “A toy line based on The Venture Bros. has been a long time coming but we now have the ideal partner on board to bring these characters to life," said Christina Miller, senior vice president, CNE. "With their distinct style and love for the series, the team at Bif Bang Pow! has created an impressive line that will excite our fans and meet their discerning tastes." 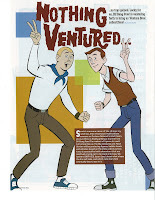 The Venture Bros. creator Jackson Publick, who has been working closely with Bif Bang Pow! on the planning and creation of the toy line, adds, "Finally. It's about time someone made some action figures based on the show. This is going to be great!" Bif Bang Pow! (bifbangpow.com) produces first-rate collectibles for such popular properties as Dexter, Lost, Californication, The Venture Bros., The Twilight Zone, The Big Lebowski, and Flash Gordon. Founder Jason Lenzi is a seasoned television producer and the ultimate fan of cultish pop culture. So when he created his company in 2005, he took the fan's perspective. His idea was to bring items to the marketplace that he himself would want to own. Cultivated from TV, movies, books, comics, music, and more, Bif Bang Pow!’s mission is to provide high-quality action figures, toys, and collectibles to the massive cult audience (and kids of all ages) that wishes these toys were already in their collection. Bif Bang Pow! is a unit of JLA Direct, LLC. Cartoon Network Enterprises (CNE) is responsible for building consumer products and merchandising programs for a wide range of brands by securing and supporting long-term licensing partnerships across all categories. As the global branding and merchandising arm of Cartoon Network and Adult Swim, the division manages the consumer product programs for the networks’ award-winning original programming, brands and characters including Ben 10, The Secret Saturdays, Chowder, The Marvelous Misadventures of Flapjack, Adult Swim and more. CNE also serves as a third party licensing agent through strategic partnerships with Nelvana Enterprises and Spin Master for the award-winning Bakugan brand, CAKE Entertainment and Fresh TV for the hit Total Drama franchise and the PGA of America for the youth marketplace. Adult Swim (AdultSwim.com), launched in 2001, is Turner Broadcasting System, Inc.’s network offering original and acquired animated and live action series for young adults. Airing nightly from 10 p.m. to 6 a.m. (ET, PT), Adult Swim shares channel space with Cartoon Network, home to the best in original, classic and acquired programming for children and families, and is seen in 97 million U.S. homes.